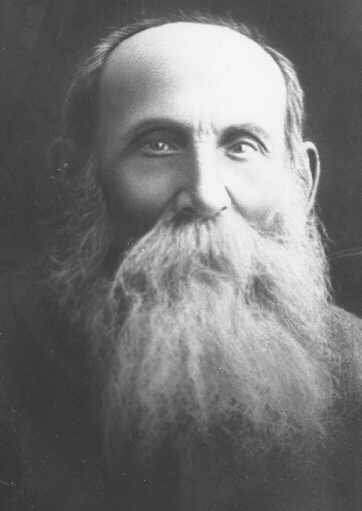 A.D. Gordon (1856-1922) was born in 1856 in Podolia, Russia to a religious family. After his marriage, Gordon became manager of a large tract of land which was rented out for farming. He was also involved in the Hovevei Zion movement and was an ardent Zionist. When the lease on the lands he was managing expired in 1903, Gordon decided to emigrate to Palestine and became an agricultural laborer at the relatively advanced age ­ forty-seven. Until that time he had been a white collar worker and had no experience in manual labor. Gordon lived first in Petah Tikvah, later in Rishon Le-Zion and finally settled in Degania, the first kvutsah. He made a religion of work. He believed that physical effort on the land would bring about his personal redemption, and that such labor would also redeem the Jewish people. He argued that the work created an organic interrelationship between the man, the land and culture. Gordon founded the Hapoel Hatzair Labor Zionist movement, and it is in fact his pragmatic and non-Marxist socialism that dominated the Israel labor party. Gordon died in 1922 and was buried in Degania.